If you’re been playing the games and stakes I’ve been playing for most of the past decade, you probably know David Long, who’s been in the hospital since last week. I wouldn’t normally intrude on anyone’s illness, but Dave’s been my travel companion on a number or trips to Lincoln City and Pendleton—sometimes for a day, sometimes for overnighters—and he outed his condition on Facebook the other day, but the algorithm in its infinite wisdom didn’t bother showing it to me for four days. Dave’s been playing poker a lot longer than I have, he’s been a fount of info and gossip for me since I met him after I started playing at the Portland Players Club. In one of those odd coincidences of fate, even through we lived in Eugene at the same time in the mid-’80s without having run into one another, his wife, Arlene, was the person who took over my Sunday night slot on KRVM-FM when I moved to Portland. We’re due to make another trip to the beach next month for the Fall Coast Poker Classic, so send your best wishes! We have 8 weeks of Poker Time featuring these guys coming up! By “8 weeks of Poker Time” with these guys I’m pretty sure they mean that the rest of the session I was playing in is going down the memory hole. Bye-bye, fame! Sort of a truncated poker week for me. Just a couple of tournaments on Ignition Casino (PLO and PLO8) where I made it halfway through, a $100K Cheap Seats step 1 satellite where I made it to the chip lead briefly before losing 2/3 my stack in a 70/30 hand. I made a horrible call in the Final Table First Friday $20K, managed to hang in until I got it all in against another short stack with A♣K♣ v J♥T♥ and he hit a straight on the river to leave me with less than 3bb UTG. So, out on the next hand. I did manage to chop my original home game (14 players and a bunch of rebuys) with my cousin’s husband Saturday, so the week wasn’t a complete loss! Seth Davies cashed again at EPT Barcelona in Event #27 €10,300K NLHE12th of 327. The prize pool reached more than €4.2M (just under $5M). Down at Aria in Las Vegas at the 2018 Poker Masters, Almedin Imsirovic continued his assault on the high rollers, just missing getting on the TV final table in Event #1 $10,500 NLHE. The Main Event of the Mid-States Poker Tour at Canterbury Park is a $300K GTD $1,100 buyin with entry starting tomorrow. The Commerce Poker Series in in its last few days. The first flight of their $500K GTD $1,100 buyin Main Event starts tomorrow, with flights on Friday and Saturday. See the Planner from two weeks back for info about the Muckleshoot Fall Classic. There’s a satellite tonight and next Wednesday, and another this Sunday. The first event is a week from Friday. The Venetian Deepstack Extravaganza III continues through 23 September, this weekend is a $200K GTD ($600 buyin) Ante Up Poker Tour Thursday through Saturday. The series ends with a $250 buyin $250K GTD event. WSOPC Thunder Valley $1,700 Main Event has $500 GTD and entry flights on Friday and Saturday. I5 is open again for now. The Aria Poker Masters$100K buyin Main Event starts tomorrow. HPT Golden Gates starts Thursday with a four-flight $400 buyin tournament. Their $1,650 Main Event begins next Wednesday. The Gardens Poker Classic (starting Friday) is the third stop on the West Coast for the PokerStars Platinum Championship, where you can compete for a ticket to a $25K buyin in the Bahamas in January and $5K in expenses (also known as the cost of a banana at the Atlantis Resort). 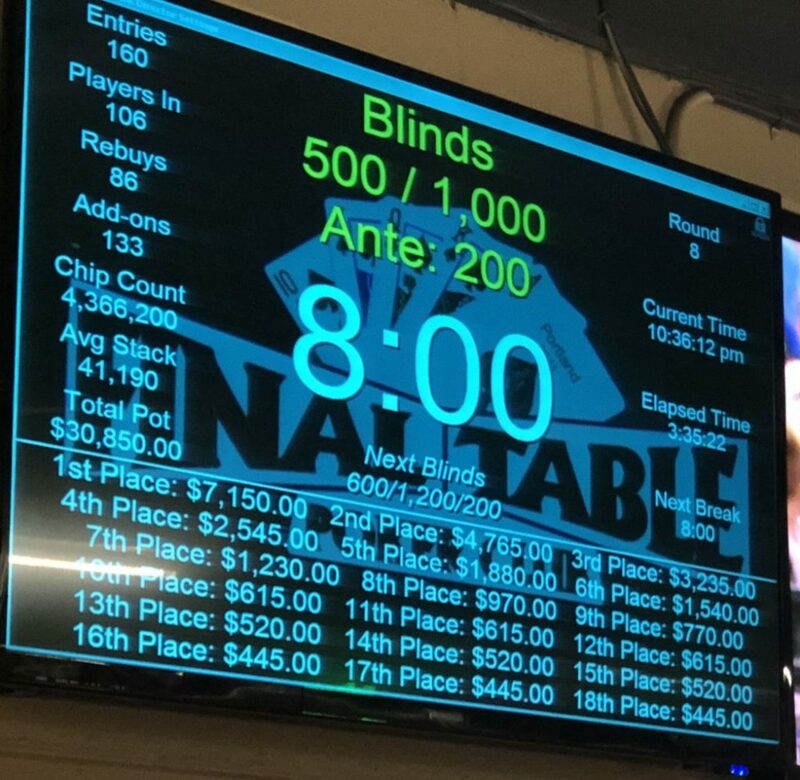 There are a few other things going on during the Classic, including a $300K TD, a $200K GTD, a $550 buyin 8-Game Mix, some HORSE, and a Progressive Bounty tournament. The Pechanga Endless Summer Poker Series features a $200K GTD Main Event with a $400 buyin, as well as some leadin events and 3 (count ’em three!) Survivor tournaments (the Ladies Survivor has a $150 buyin while the other two are just $70). Pechanga Resort and Casino is about halfway between LA and San Diego, inland from Oceanside about 20 miles.